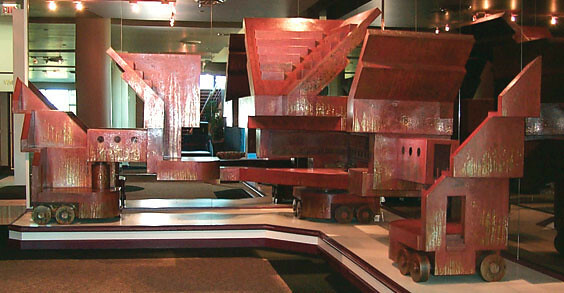 Solid, industrial, weathered – this large steel sculpture demonstrates strength and the potential for powerful movement. Created specifically for the Weidner Center, Road Show reflects the artist’s interest in architecture, vehicles and machinery, while making a subtle reference to traveling performances. 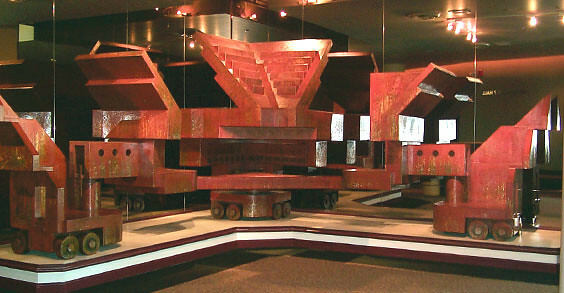 Road Show also includes specific references to the Green Bay community and its history such as wheels reminiscent of the railways, stepped “bleachers” that echo Lambeau Field, and portholes symbolizing the shipping industry. These elements are balanced with an almost playful “jungle gym” sensibility and a mirror that invites interaction by the viewer, making it a piece that involves the entire community. Artist Andrew Arvanetes describes his works as “narrative vehicular objects” that suggest “movement through time and space.” He hopes that viewers will “transport” themselves into the piece to become participants. Road Show was commissioned and partially underwritten through the Wisconsin Percent for Art Program, and supported by a generous gift from Sharon and Thomas Lutsey in memory of Evelyn Christina Lutsey.